These are gluten free energy muffins due to the great amount of protein found in the Chia seeds and peanut butter. This recipe also uses pure RAW Honey. If you’ve read my posts on honey in the past (Honey for Allergies , The Destruction of Sugar), you know how beneficial honey can be and how important it is to find a source that is true honey. Some gluten free breads or muffins can be dense or too “earthy” for many tastes. Not so with this recipe. IN FACT, it passed the ultimate test by being scarfed down by one of my more picky children. They are light and fluffy, full of great protein from the chia seeds, and are very moist and delicious. A gluten free Pumpkin Chocolate Chip muffin recipe that is light and fluffy and full of great protein from chia seeds. Preheat oven to 375 degrees F. and line muffin tin with muffin liners. Combine peanut butter, pumpkin, eggs, vanilla extract and honey. Blend oats in blender until it is flour consistency. In a separate bowl combine oats, chia seeds, pumpkin spice, baking soda and chocolate chips. Stir in dry ingredients into your wet ingredients. Bake for 20 minutes, or until fork inserted comes out clean. Enjoy! Let us know how you like them. My mom makes these in miniature size in bulk when she has a group of people or large family gatherings. They’re great to have around as a snack for the kids as they go through the kitchen. Peanut Butter and Pumpkin 😉 That is fabulous! Where do you enter? I can’t find an entry form anywhere, even on the company website. There’s a link at the bottom of the page. Sorry, my blog is being weird and loading it up right now. Working on that. The link will take you to the reflected though. Oh my goodness, those look absolutely scrumptious! Thanks for sharing the recipe! I might just have to try and make these! They are really yummy. I love that it has no crazy flours that I don’t have, just grind the oats in the blender. I have lots of gluten free friends and I love to bake things this time of year to share with family and friends so these are great to make for them! And they sound delicious! Can’t wait to try them! Thanks for sharing! That’s why I worked on this recipe. I have a friend who needs gluten free and she eats with us once a week. I was super excited about how these turned out. What are blended oats? Oats run through the blender? I would like to make this recipe before our trip this weekend. Hi Julie, sorry it’s been a few hours getting back to you. It’s been a very busy day. Yes, you can buy oat flour, but since I don’t use it that much I just blend the amount needed in a blender. Works great. Thanks Kelly. Great idea. Can’t wait to taste them. Oh my goodness. 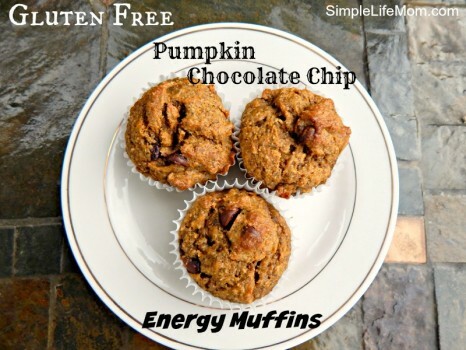 I love the pumpkin chocolate chip muffins…looks delish! Thank you Corina. They are good. I’m making another batch tomorrow. I made these tonight. They are SO good!!! I used sun butter and oat flour. Yummy! Great! See, I told you they were good 😉 Now I’m definitely making another batch in the morning!! did yours turn green? Whenever I use sunbutter they turn green! Someone thought it might be the reaction of baking soda and the sunflower seeds? Where do you find gluten-free oats? I haven’t been able to find these yet. Oats ate naturally gluten free. For those violently allergic to gluten, they may have to search for oats that are not processed in the same facility as wheat. But the few people I know who do react strongly can just buy regular oats and are fine. These are so good that I had to make a second batch tonight! Those look wonderful and what an awesome giveaway too. Fingers crossed! 🙂 Winner announced on Monday!! These look so yummy, I’ve been trying to bake gluten free often and get a hold of it – these are going on my list for sure! Love the giveaway, I’m in the UK so can’t enter unfortunately but good luck to everybody entering! Thank you Michelle, and thanks for stopping by. These look wonderful. I am looking for new and tasty gluten free recipes! Cannot wait to try this! I have been seeing lots of chia seeds recipes and I really want to try them! They seem like a great ingredient for healthy snacks. These muffins sound wonderful! Thanks for sharing with Hump Day Happenings. Thank you Jenna. Chia seeds are the big rage right now, but they do have a powerful load of protein and nutrients so I think they’re great to add to things like muffins, oatmeal, smoothies, etc. Your Muffins look fantastic! Hope you are having a great day and thanks so much for sharing your awesome post with Full Plate Thursday. WOWZA! These are so delicious! Try using 3/4 cup blended oats and 1/4 cup rolled oats. Gives it a slightly more chewy/nutty texture. My very picky son ate them and was thrilled to have been given a “treat” for breakfast! Many thanks! These look so yummy! I can’t wait to make them and test them out on my 12 year old son. He loves muffins and this is a healthy alternative! It really is – and a great way to help keep those boys full. My 12 year old is a bottomless pit. 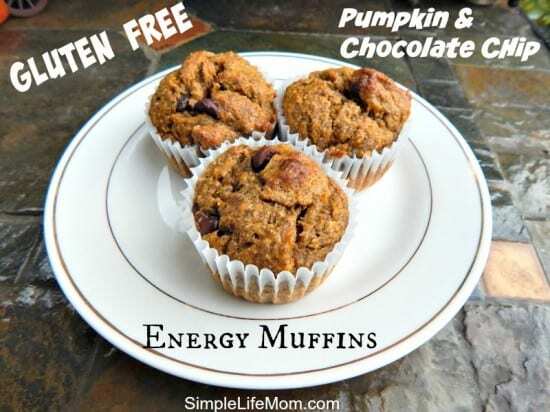 This little muffins sounds great and filled with loads of healthy ingredients. Thanks for sharing on Real Food Fridays. Pinned & twitted.